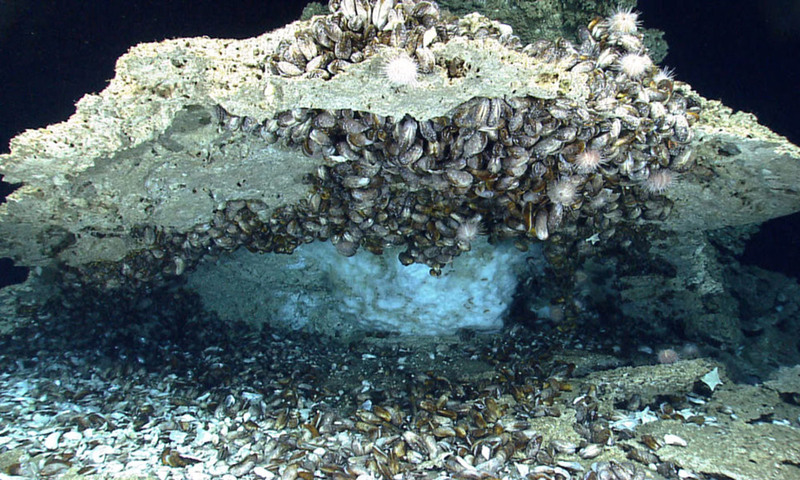 Gas hydrate (white material) on the floor of the northern Gulf of Mexico under a cap of rocks encrusted with deep-sea mussels. The photograph was taken by a remotely operated vehicle operated by the National Oceanic and Atmospheric Administration’s Ocean Exploration and Research Program in 2014. The breakdown of methane hydrates due to warming climate is unlikely to lead to massive amounts of methane being released to the atmosphere, according to a recent interpretive review of scientific literature performed by researchers at the U.S. Geological Survey and the University of Rochester. Methane hydrate, which is also referred to as gas hydrate, is a naturally occurring, ice-like form of methane and water that is stable within a narrow range of pressure and temperature conditions. These conditions are mostly found in undersea sediments at water depths greater than 1000 to 1650 feet and in and beneath permafrost (permanently frozen ground) at high latitudes. Methane hydrates are distinct from conventional natural gas, shale gas, and coalbed methane reservoirs and are not currently exploited for energy production, either in the United States or the rest of the world. The new review, published in Reviews of Geophysics, concludes that current warming of ocean waters is likely causing gas hydrate deposits to break down at some locations. However, not only are the annual emissions of methane to the ocean from degrading gas hydrates far smaller than greenhouse gas emissions to the atmosphere from human activities, but most of the methane released by gas hydrates never reaches the atmosphere. Instead, the methane often remains in the undersea sediments, dissolves in the ocean, or is converted to carbon dioxide by microbes in the sediments or water column. Summary of the locations where gas hydrate occurs beneath the seafloor, in permafrost areas, and beneath some ice sheets, along with the processes (shown in red) that destroy methane (sinks) in the sediments, ocean, and atmosphere. The differently colored circles denote different sources of methane. 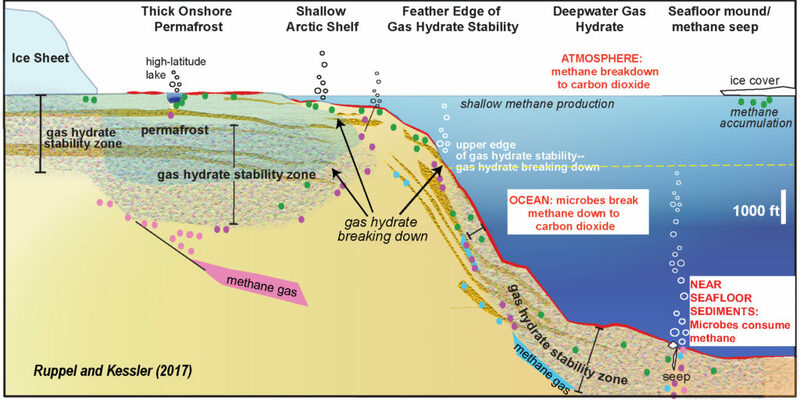 Gas hydrates are likely breaking down now on shallow continental shelves in the Arctic Ocean and at the feather edge of gas hydrate stability on continental margins (1000-1650 feet). The USGS and the University of Rochester research that contributed to the review was largely supported by the U.S. Department of Energy and the National Science Foundation. « Earth’s magnetic field—reversing or fluctuating?